Victims of Fraud: Who is Most at Risk? According to the most recent Global Fraud Study by the Association of Certified Fraud Examiners (2010), private companies had the greatest median loss due to fraud. Small organizations with fewer than 100 employees had the greatest percentage of fraud loss with more than 30 percent being affected. The median loss for small organizations was $155,000. The top five types of frauds for small businesses (<100 employees) are: billing, (28.7 percent), check tampering (26.1 percent), corruption (25.5 percent), skimming (21.6 percent) and expense reimbursements (16.8 percent). The specific risks to any organization depend on many factors such as industry, operating environment, processes and culture. However, small private companies in particular need to be aware of the dangers of fraud from within their organizations and take the appropriate precautions to help prevent it. Organizations who suspect fraudulent activity should contact a Certified Fraud Examiner to investigate the extent of the fraud and recommend internal controls to help deter employees from committing fraud in the future. 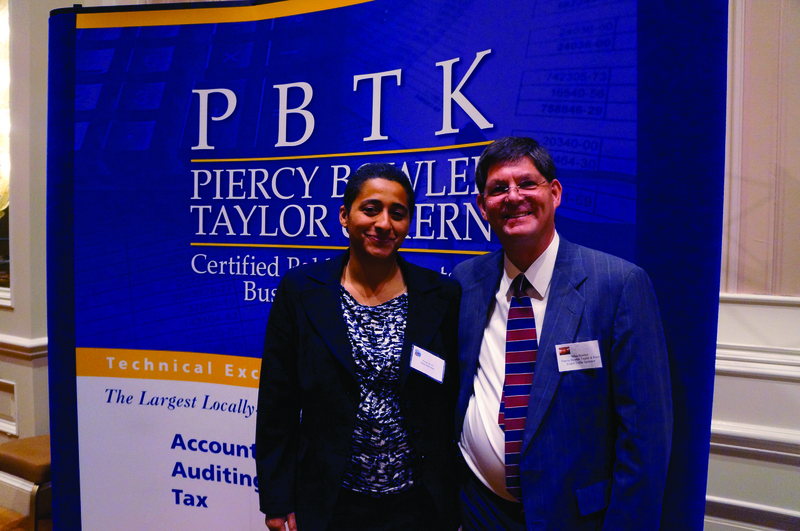 PBTK was honored to participate in the Meet the Judges mixer held recently with the Clark County Bar Association. Held at the Four Seasons, PBTK had a booth at the event. Mike Rosten, CPA, CFE gave our raffle prize to winner Koren Boyd, who went home with a new iPod Nano and a wrist strap. Congragulations Koren! Asset Misappropriation: The theft of misuse of company assets. Cash Larceny: The theft of money that has already appeared on the accounting system. Cash Schemes: The theft of money in any form, currency or checks. Chain of Custody: Refers to (1) who has possession of an object and (2) what they have done with it. Computer Crime: Any illegal act for which knowledge of computer technology is used to commit the offense. Computer Forgery: When a computer is used to create a forged document or to illegally alter existing documents. Computer Fraud: Computer-aided activity involving misrepresentation of fact or alteration of data in order to obtain or receive something of value that causes a financial loss to some person or organization. Data Manipulation: The use or manipulation of a computer to perpetrate a crime. Embezzlement: The fraudulent taking of personal property with which one has been entrusted. Employee Reimbursement Scheme: When employees falsify information about their business expenses and cause their employers to overcompensate them by submitting inflated expense reimbursements. Evidence: Anything perceivable by the five senses, and any proof such as testimony of witnesses, records, documents, facts, data or tangible objects legally presented at trial to prove a contention and induce a belief in the minds of a jury. False Invoicing Scheme: Generating and submitting a false invoice for payment. Financial Statement Fraud: Typically takes the form of (1) overstated assets or revenue, (2) understated liabilities and expenses. Fraud Examination: A methodology for resolving fraud allegations from inception to disposition, involving the following: obtaining evidence and taking statements, writing reports, testifying to findings, and assisting in the detection and prevention of fraud. Occupational Fraud: The use of one’s occupation for personal enrichment through the deliberate misuse or misapplication of the employing organization’s resources or assets. Payroll Scheme: False documents are produced that cause the victim company to unknowingly make fraudulent disbursements. Ponzi Scheme: A fraudulent investment scheme in which money contributed by later investors generates artificially high dividends for the original investors, whose example attracts even larger investments. Skimming: The theft of cash that has not yet been recorded in the accounting system. Theft: The unlawful taking and removing of another’s personal property with the intent of deriving the true owner of it. Source: Definitions by Association of Certified Fraud Examiners (ACFE) or Black’s Law Dictionary. According to the “2010 Mortgage Fraud Report Year in Review” prepared by the Financial Crimes Intelligence Unit of the FBI, mortgage fraud continued at elevated levels in 2010, consistent with levels seen in 2009 and is resilient and easily adaptable to economic changes and modification in lending practices. One type of mortgage fraud is the use of straw buyers. Straw buyers are loan applicants who mortgage fraudsters use to obtain home loans, though they have no intention to occupy the properties or to pay back the loan, (ACFE 2010 Fraud Manual). Several recent local cases show us that Las Vegas is not immune to this scheme and also, other detrimental effects of straw buyers. In the first case, the secretary of a Las Vegas-based real estate investment firm pled guilty for their role in $3.4 million mortgage fraud scheme (FBI Press Release, January 5, 2012). Along with co-defendants, they conspired to execute a fraudulent scheme where they recruited straw buyers and bailout buyers, acted as straw buyers themselves and falsified mortgage loan applications with federally insured financial institutions from April 2006 through November 2006. In the second case, prosecutors allege that co-conspirators devised a takeover scheme involved finding straw buyers to buy condominiums and getting them to run for seats on the Home Owners Association board (Review Journal, Jeff German, November 12, 2011). After being elected to the boards, the straw/bailout buyers would send HOA business to the co-conspirators. At closing, the check is from someone other than the party to the contract. Borrower resides in different state than purchasing property, which is described as a primary residence. Quit claim deed is used very close to loan closing. Investment property represented as owner-occupied. A third-party signed on the borrower’s behalf. Names added to purchase contract. There is no sales agent involved. There are indications that the property seller defaulted. Existence of a high FICO score. Gift used for down payment despite the presence of good assets. With this type of fraud, the lenders and title companies need to be aware of these red flags. Mortgage companies who think they may be victim to this scheme should contact a Certified Fraud Examiner to conduct a fraud investigation.